Let me start by saying sorry for the skanky low quality toilet pics, but last time I did a 'night out' outfit post, you all seemed to really like it. (you can see it here). See, in my drunken state I'm still thinking of you all! I would love to be able to do evening outfit posts properly but the lighting is so bad at night, it would probably look worse than these photos! 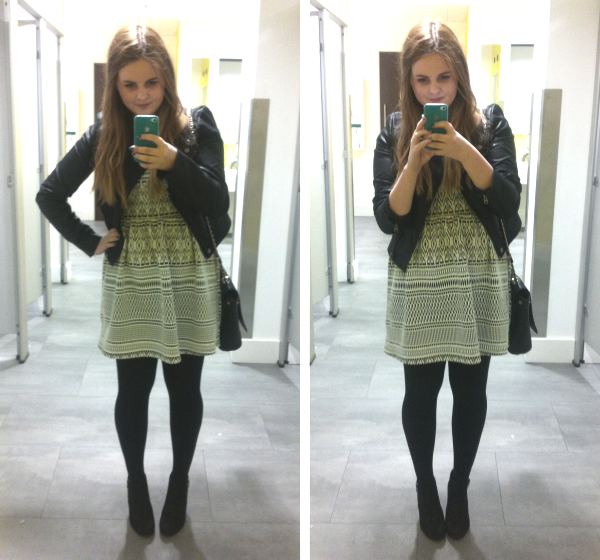 I wore the Topshop Aztec print dress, which I can't find on the website anywhere. With my leather jacket, also from Topshop. I barely ever go on a night out without my leather jacket, it's perfect for keeping me warm when walking from bar to bar, as well as giving any outfit an edge. Hope you all had a great weekend, what have you been up to? That jacket would look so cool paired with so many clothes, that's why I love it! Gorgeous dress. You look stunning doll!